1 bunch of fresh kale leaves, stemmed removed. 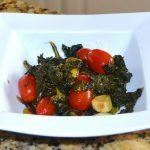 Sauté kale, garlic cloves, sweet cherry tomatoes, pistachios in olive oil, add vinegar, then add brown sugar. Sauté until kale is crisp and vivid green or to your taste. The kale will shrink in size while cooking, so double up if you are serving a large crowd. If you don’t like Kale, use fresh green beans, Brussel sprouts, dressing croquettes or any colorful herb combinations, rosemary sprigs, or fruit selections- small lady apples, orange slices. Place this colorful dish around the base of a Crown Roast for a beautiful Presentation! This is a 2 cup serving that is placed in the center of a standing Crown Roast but could be served as a side dish for any meal. You may want to double recipe if using as a side dish for more than 4 servings.